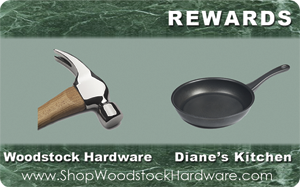 Join Woodstock Hardware’s Rewards Card program and earn points for your purchases at both Woodstock Hardware and Diane’s Kitchen. It’s that simple. Use the form on this page or sign up in person at Woodstock Hardware today! Give us the month you were born in to earn a Happy Birthday $10 credit on your Rewards Card. Rewards Card Members Sales Items – Save 33% on each item! So come in and sign up for your Rewards Card today. Start saving on all your purchases. Pass this on to a friend. Tell them to sign up too and enter your name in the Comments Field. You will receive 100 additional points.